Compression moulding: the compression mould is also known as pressing mould. Moulding process characteristics of the mould is that plastic raw materials is added directly in the open mould cavity, and then mould clamping, plastic is molten was under heat and pressure and filled cavity with a certain pressure. At this time, the molecular structure of plastic produces chemical crosslinking reaction, gradually hardening and finalizing, the compression mould is mainly used for thermosetting plastic, which is mainly used in the shell of electric switch and daily necessities. Extrusion mould: extrusion mould is also known as extruder head. This kind of mould can produce plastic with the same shape continuously, such as plastic tube, bar, sheet, etc. The heating pressure of the extruder is the same as that of the injection machine. The plastic of molten state is formed continuous moulding plastic parts by the machine head, and the production efficiency is very high. Injection mould: moulding processing characteristics of this kind of mould is that place the plastic material in the heating cylinder of the injection machine. The plastic is heated and melted, pushed by the screw or plunger of the injection machine, then enters the mould cavity through the pouring system of the nozzle and mould, the plastic is formed in the mould cavity with heat preservation, pressure protection, cooling and solidification. Heating pressure device works in stages, so injection moulding can not only produce complex plastic parts, but also with high produce efficiency and good quality. 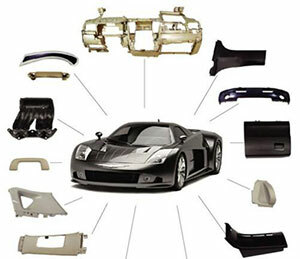 It is observed that injection moulding is a big part in plastic moulding, injection mould account for more than half of the plastic mould.The injection machine is mainly used in the moulding of thermoplastic plastic and has been used in the moulding of thermosetting plastic in recent years.